Treasure Vases are available for $175.00 US. We can accept payment by US check and via our PayPal account. You can use a credit card through PayPal. We endeavor to fill orders within 2-3 weeks of receipt. 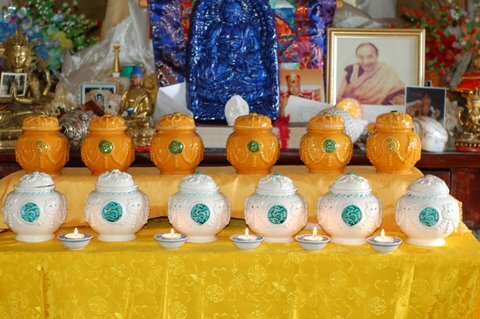 Vases are handmade by Lama Kunga Thartse Rinpoche and team of his students, filled with ritual and precious items, then blessed in the Center’s Shrine Room. For US check payment, vases cannot be shipped without receipt of a valid check.